My latest post features an audio blog of Father’s Day. Just click on the arrow to hear the audio. 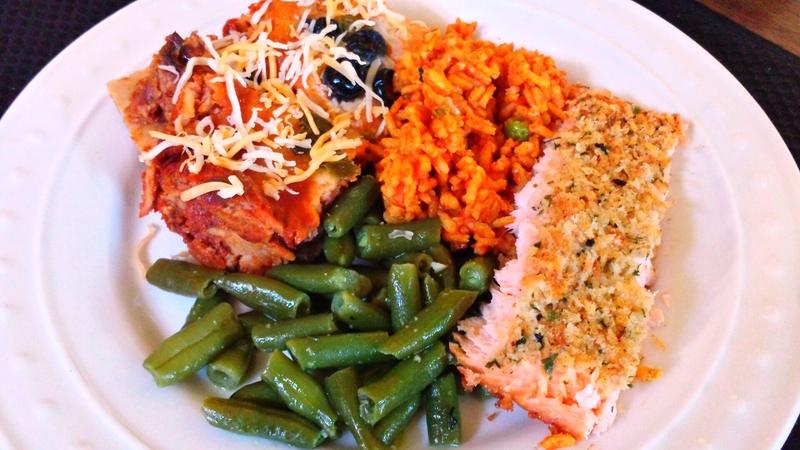 It was a simple and delicious meal of string beans sauteed in a little butter, fresh chopped garlic, olive oil, summer savory, sesame seed oil, sea salt and crack pepper; Spanish brown rice, organic turkey enchilada casserole, and herb panko crusted bake salmon. This Father’s Day was full of great memories of my dad and a day that celebrated the wonderful dad my son is to his 18 month old son. Remember: Father’s are essential. Don’t wait for Father’s Day to let that special father or father figure know how much value and strength they have added to your life. This entry was posted in Foodies and tagged butter, Casserole, caviar, collard greens, enchiladas, Father's Day, garlic, panko, salmon, Spanish rice, turkey. Bookmark the permalink.